The revenue figures are in millions of dollars. These numbers, published this month, include flash memory going into smartphone and other mobile devices, as well as consumer and enterprise solid-state storage. Samsung dominates with a 37.2 per cent share of the market, we're told, which is roughly twice that of each of the second and third-ranked suppliers: Toshiba and WDC. 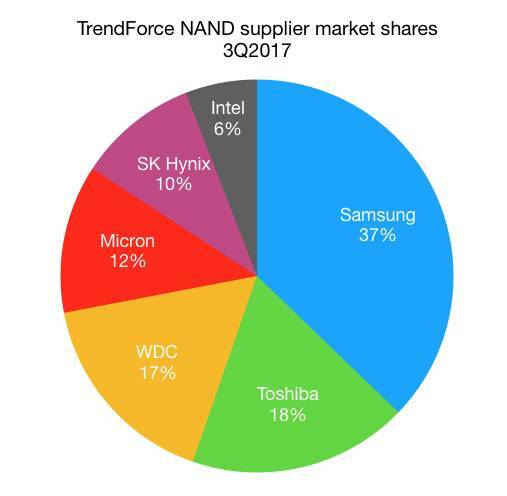 TrendForce said all the suppliers are shifting their factory lines toward 64-layer 3D NAND – SK Hynix is pushing 72-layer flash, apparently – and as this manufacturing process matures, yields will rise. The beancounters expect the flash market will over supply next year because of this, which should mean prices on SSDs and flash memory chips will relax somewhat.